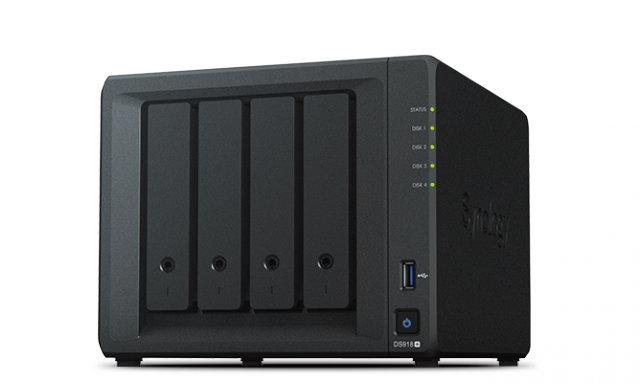 Synology has updated its range of NAS devices aimed at prosumers, announcing the four-bay DS918+ and DS418 and the two-bay DS718+ and DS218+. 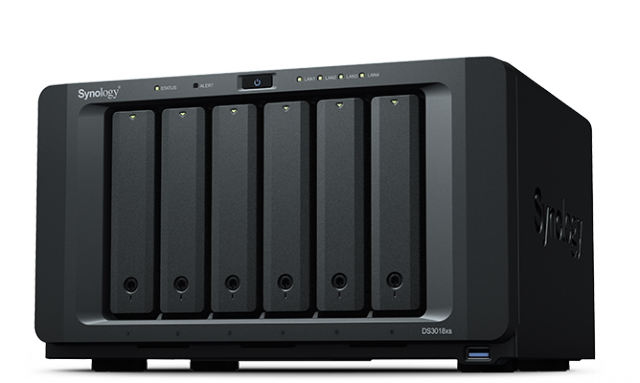 Synology also unveiled its first six-bay tower NAS, called DS3018xs, which is designed with businesses in mind. The DS918+, DS718+ and DS218+ are part of Synology's plus range, which is optimized for bigger workloads. The DS418, meanwhile, is meant to appeal to price-conscious buyers that are looking to store a significant amount of data. "The new DS918+, DS718+, and DS218+ are optimized to be your digital video libraries, and will bring you an excellent viewing experience with high definition live video transcoding, regardless of device limitations," says Synology. The DS918+ is the most capable new entry in the plus range, packing a quad-core Intel Celeron J3455 processor, up to 8GB of RAM (it comes with 4GB as standard), and two Gigabit LAN ports, as the main standout features. It also gets the AES-NI encryption engine, support for M.2 NVMe 2280SSDs, two USB 3.0 ports, an eSATA port, and support for read/write cache and TRIM when paired with SSDs. Performance is quoted at over 225MB/s and 221MB/s for encrypted sequential reads and writes. The DS718+ is similar in specifications, featuring the same processor, but only up to 6GB of RAM (it comes with 2GB as standard). It also gets two Gigabit LAN ports, but adds one more USB 3.0 port (for a total of three) to the mix. Performance is quoted at up to 226MB/s and 184MB/s for encrypted sequential reads and writes, respectively. The DS218+ is the entry-level NAS in the range, featuring a dual-core Celeron J3355 processor, up to 6GB of RAM (it comes with 2GB as standard), a single Gigabit LAN port, three USB 3.0 ports, one eSATA port, but no support for M.2 NVMe 2280 SSDs. Performance for the DS218+ is quoted at up to 113MB/s and 112MB/s for encrypted sequential reads and writes, respectively. It gets 4K UHD transcoding, like the DS918+ and DS718+. In the value range, the DS418 is a pretty interesting option. It packs a quad-core processor clocked at 1.4GHz, hardware encryption, 2GB of RAM and two Gigabit LAN ports. It also gets 4K UHD transcoding, and number of other features typical of Synology devices. What about the DS3018xs? Well, this is like a tour de force for Synology. It gets a dual-core Pentium D1508 processor clocked at up to 2.2GHz, support for up to 32GB of RAM, four Gigabit LAN ports, and two M.2 NVMe slots at the bottom, and 10-bit 4K UHD transcoding, just to name a few of the main features. "Responding to the demands from our customers, DS3018xs is built as a comprehensive business-ready desktop NAS. Running mission-critical applications or planning virtualization deployment with DS3018xs has never been easier," explains Synology. Synology does not say when the new products will be available nor how much they will cost.